Blog posts straight to your in-box! I’m not Facebook. I won’t share, sell, or otherwise try to monetize your contact info. Join Janet on her adventures as a designer, writer, maker, and farmer in montana. no two days are ever the same. you might even see a bear or two. Last Wednesday night, I went to my first Accuquilt Block of the Month Club meeting at the quilt store in Kalispell where I took the Accuquilt class last month. The Block of the Month Club is designed to introduce quilters to a different quilt block pattern each month, and when all the blocks have been completed, they make a quilt. For $5 at each meeting, you get all the fabric, the instructions, and good food and fun. This first meeting was a bit chaotic, as more people showed up than expected (about 20) and one of the owners was recovering from a week-long illness. The teacher and staff coped gracefully, though. We were told to select our fabrics from a selection of squares, and then the staff helped those who were unfamiliar with the cutters while the rest of us sailed on. I haven’t yet sewn it together. The store chose batik fabrics—not my favorites, but a great decision on the part of the store because batiks have no right or wrong sides. And please don’t tell me that there is no biological difference between the brains of men and women; there were 20 women in this class struggling (audibly) with the spatial perception challenge of getting those parallelograms oriented properly. Thank goodness we all know how to laugh at ourselves. We were able to walk around and look at each other’s color choices. I would say about half of the quilters chose monochromatic color schemes—purple was popular—with variations in lights, darks, and mediums. There were a few people like me who threw caution to the wind and went with something retina-burning and high-contrast. One lady next to me was really struggling with the concept of contrast and couldn’t understand why choosing four medium brown batiks made a really boring block. A few of us tried to help her out with suggestions for pops of color. I don’t know what she ended up with, but she cut enough fabric to make about four blocks. 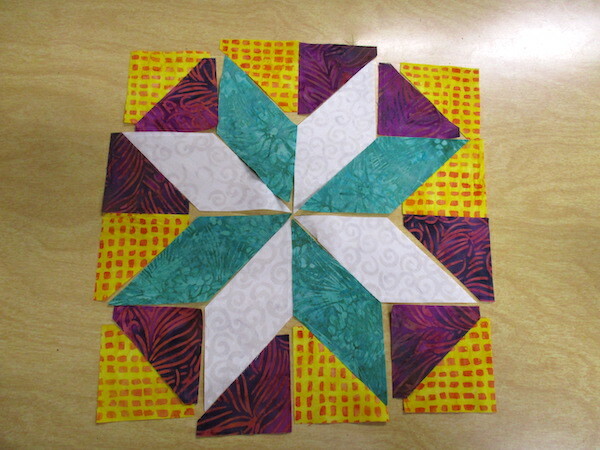 The teacher apologized for choosing this as the first block because it has Y-seams in it (where the purple, white, and green pieces come together in the block, above). I don’t know why, but there seem to be some techniques in the fiber arts that get the reputation of being difficult and thus should be avoided. I think that’s ridiculous. Y-seams require some attention to detail, yes, but if you can sew a quarter-inch seam, you can sew a Y-seam. I want to get this put together this week so it doesn’t languish. I ran errands in town yesterday morning and then—because it was snowing—I spent the afternoon working on grocery bags. That chain stitch issue has not been resolved completely. Even though it’s happening a lot less frequently, I still had three seams (out of about two dozen) where I had to fix the skipped stitches. The industrial serger is making short work of constructing these bags, though. I’m not going anywhere today and while I hope it doesn’t snow, it’s going to be too cold to work in the garden. I’ve got a sewing to-do list of half a dozen things I want to accomplish. We’ll see how far I get. I was at Joann Fabrics yesterday when DD#2 texted me to tell me that Notre Dame was burning. (She and her grandparents went to Paris for her high school graduation trip in 2015.) At first, I couldn’t wrap my head around the notion. How could a structure that has stood for so many centuries be burning? I put the news on when I got home and watched the devastation. What a huge loss for humanity and for the people of France, especially. Apr 15 It's the Middle of April! A blog that started as a way to update family and friends has turned into an ongoing record of Janet’s life as a designer, writer, farmer, and maker.